Russia has vast water resources and, where there is water, there are fish. Murmansk, the fishing capital of the north-west, employs a variety of fishing methods, but it does not have the abundance of fish you would expect. The northern basin with its fishing capital Murmansk, produces considerably less fish than the Far East (with its capital in Vladivostok). Just 268,000 tonnes were produced in 2011 as against 2,864 million tones. Yet 85% of the Russian population lives in the European part of the country - this means Murmansk is Russia’s main fishing city. I started looking around for the wealth that comes from fish as soon as I left Murmansk airport. “We used to have Ocean and Neptune fishing stores, but they closed down long ago. Maybe, the fish market? But I must warn you that there are no fish in Murmansk.” He was right. The city’s two fish markets turned out to be tiny places with about four counters each; clearly inferior to the wide range offered in the French supermarket chain Auchan in Moscow. As for delicacies, however, we were offered some smoked rockfish that it is not possible to find anywhere in Moscow. The smoked halibut looked fine, too, but we never found what you might expect to see in a city on the sea – freshly caught fish. “They take everything they catch to Moscow”, a seller said. A short tour of Murmansk elicits no fish restaurants either. My photographer and I decide to find out how the fish wealth of Murmansk flows to Moscow - bypassing local consumers. The giant banner “75 years of Murmansk Sea Port” hangs against the gloomy backdrop of the dilapidated port facilities. “This place used to be full of life, with up to four rows of boats moored at once”, a sailor of about fifty tells us. The port administration estimates the current annual fish shipment to be 250,000 tonnes: about a quarter of its actual capacity. A record shipping volume of 3.3 million tonnes was achieved back in 1991. 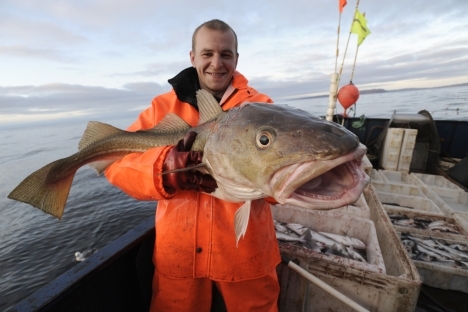 Maybe there is less fish in the Barents Sea? “No”, they say. There could be even more than before – the catch in the 1990s was smaller than usual, which is why the fish thrived. The reason must be the 21% reduction in the fishing fleet since 2000. The average fishing boat is 25 years old and 80% of the boats are at least 20 years old. The import duty on fishing boats is 23% and it almost makes it pointless to go to sea at all. Many of the fishing boats purchased by Russian fishing companies abroad (and catching fish under the Russian flag) never call at Russian ports because they will have to clear customs: they sell their catch in Norway instead. Many ships which are officially registered in Murmansk also prefer to sell their catch in Norway where the customs procedure is very simple: take your catch there, unload the boat in no time at all, get your money and go to sea again. We watched the trawler Huginn unload three days’ worth of catch (95 tonnes of codfish) at the port. The boat technician, Ivan, explained that the crew almost always cut and clean the fish at sea. Gutted, headless fish are then packed into boxes with ice where they can last for up to 10 to 12 days: or they can cut out the fillet parts and freeze them in the onboard processing room. Fins and tails are not worth transporting back to port as they are uneconomical: they are simply thrown away. The liver is canned onboard if they have a machine, if not, they either freeze it or throw it away. Some of the gutted fish will be sold and some will be processed in the shop run by the ship’s owner. I watched the unloading process and then occupied a strategic spot near the kitchen where they were treating buyers to fresh fish soup. One of the guests – a man who looked like a typical businessman and who refused to name his company – said he was buying cooled fish for Moscow supermarkets and was relaxing while the fish were being transferred from Huginn to his cold storage truck. He said he does not work with the fishermen who try to conceal some of their catch from inspectors. To do this the fish are packed too tightly in boxes - affecting the quality. Afterwards, we visit two more medium-sized trawlers – the Kiev, built in 1991, and the St Petersburg, built in 1992. Both were unloading crates with frozen fillet and canned liver. The economic picture looks like this, according to Vladimir, assistant director of the company that owns the St Petersburg: a used medium trawler costs from $400,000 to $800,000 depending on its condition. A day at sea costs another $5,000 to $8,000. You can catch up to 200 tonnes during a 20 to 25-day run at sea. They buy gutted headless fish at 90 rubles a kilo at the port, which makes a $450,000 profit margin per run. The profit seems fine even if you deduct annual maintenance and inspection fees and taxes, etc. Yet the boat will not break even quickly. With a 1,000-tonne annual codfish quota, the boat will stand idle for up to six months a year and working for cheap fish which is supplied to domestic markets is often more trouble than it is worth. This is the issue: Murmansk has no fish because the fish is being supplied to foreign markets, not because they take it to Moscow. The Murmansk Fish Product processing shop at the port was upgraded in 2005 and stands out against the scruffy background of the rest of the harbor. It is very clean and Ivan Proskuryakov, deputy production director, says rebuilding and equipping it have cost the company 23 million euros. The shop has a daily capacity of 20 tonnes of raw fish and produces between 200 tonnes and 250 tonnes of frozen cod fillet per month. We watch a shift of about 30 women process 700 kilograms of codfish. They are neat fillet pieces which are glossy when frozen: I do not ever remember seeing anything similar in Moscow. This fillet is exported to Norway, the Netherlands and even Brazil. Waste products, such as bones and fins, are pressed into tightly compressed chippings and sold to animal farms as fodder. Some of the waste such as the backbones is also exported – Europeans dry these precious products and sell them to Africa. Most of the domestic supply consists of unsightly cod fillet and smaller haddock fillet pieces. According to Proskuryakov’s estimates, this year’s sale price of 145 to 155 roubles per kilo results in a zero percent margin for the company. No-one is willing to buy more expensive stuff: Europe has been hit by the recession and cod prices have fallen. However, it is still profitable to export any batch of more than 20 tonnes. Teriberka is on the edge of the Barents Sea. On the hill above it stands a frontier post and, at its foot, the village. From here we can see the carcasses of fishing boats. The village looks as if it has been ruined by an earthquake – it is the first time I have ever seen so many abandoned houses, including large apartment buildings of three stories or more. The streets are empty and the dogs which are chained near the car and boat garages do not even bark. A brand-new building with a golden sign – the local Shtokman gas field development office – stands out. They have a gas deposit nearby which Shtokman is scheduled to start developing in 2016 and they are building an LNG unit for the new project. Local residents are looking forward to the new jobs that the project will create. But will they give up their nets? ”Yes, they all use nets here”, a woman in the Shtokman building tells us. “They won’t talk to you, though.” I feel as if I were in a Sicilian village – every child knows the chief poacher and where to buy fish or crab, but they all honor a code of silence. We come up to the harbor. A frontier guard walks up to us because this is an important border area. Many of the locals catch fish to provide for their families, he says. “It’s, like, we inspect them, and they, like, never try to conceal anything”, he tries to explain and then points at a man leaving in his car. “See the captain who has just unloaded that smaller trawler? He’s our chief poacher.” Is he joking? I wouldn’t know. There’s a code of silence.